Kyle Wincott is a corporal in the Marine Corps who is serving in Afghanistan, and we meet the family he has left behind early in the film as he Skypes with them from his barracks. His mother and father and younger brother live somewhere in east Texas, and his dad (Thomas Haden Church) runs a storage rental facility in their small town. Mom (Lauren Graham) encourages her teenage son, Justin (Josh Wiggins), to stop playing video games long enough to speak with his older brother, but he ignores her. So, we have two parents who are struggling with one son who is, in turn, struggling to find himself and figure out his place in the world. Justin reveres his older brother Kyle (Robbie Amell), but also resents the attention showered on him by their very proud parents. Kyle is a dog handler in Afghanistan, and he and his Belgian Malinois, Max, often take point on patrol, since Max can sniff things out his human Marine companions can’t see or smell. Part of Justin’s resentment stems from the stories he has heard while growing up (from others, not his dad) about the hero his father was in the Iraq war, and the bond this naturally creates with Kyle. When he’s not playing video games, Justin loves riding his bike on trails in the woods with his friends. He occasionally cracks the code on new video games and sells the unlocked version to a rather shady character named Emilio (Joseph Julian Soria), who is somehow related to Justin’s best friend, Chuy (Dejon LaQuake). Justin and Chuy enjoy hanging out and riding bikes, although their companionship is made more interesting and complicated when Chuy’s pretty cousin, Carmen (Mia Xitali), moves in with Chuy’s family. And then the worst happens: two Marines in dress uniform arrive at the Wincott’s home unexpectedly, about a week before Independence Day, to deliver the news no parent of a soldier ever wants to hear. Additionally, we soon discover, Max is completely unresponsive to any other handlers, having imprinted so deeply on Kyle that he has become dangerous. So dangerous, in fact, that the Corps will need to put him down. That is, until Max meets Justin. 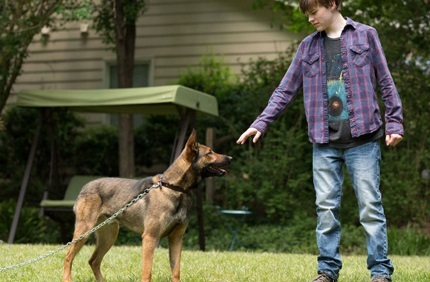 The dog recognizes something of Kyle in the brother, and a decision is made to have Justin care for the heroic and lonely dog who is suffering from an acute case of canine PTSD. Justin is not at all in favor of this plan, but his parents feel strongly that Max is part of their family, because of the extremely close relationship he had with their son. So Max comes to stay with the Wincotts, and our story begins. None of this is spoiler material; you can pretty much figure every bit of this out from watching the trailer for Max. Hollywood has a long history of making movies about dogs: Old Yeller, Beethoven, Marley & Me, 101 Dalmatians, My Dog Skip, Benji, The Incredible Journey, Turner and Hooch, K-9, The Shaggy Dog, Cujo, The Ugly Dachshund, as well as a slew of Rin Tin Tin and Lassie films. There are literally hundreds of them, and, no doubt, there will be many more in the future. Dogs have had a lock on the title “Man’s Best Friend” for centuries, so it’s only logical that we tell stories about our fur-covered, four-footed friends. I’ve had a lot of dogs growing up, some of them very smart, and a few I trained extensively, but I never had a meaningful conversation with any of them where they gave me specific details or directions. Or the other common absurdity, where the dog instinctively knows when and how to do something ridiculously un-doglike, like climbing a ladder and jumping onto a convenient skateboard to then slam into the unsuspecting, bumbling bad guy who is holding the dog’s owner at gunpoint. Or something along those lines. It’s amusing, I suppose, to small children, but stupid beyond belief. Most dogs are doing pretty good to sit and stay when they’re told, but fail to understand the inappropriateness of licking themselves when company is over trying to enjoy dinner. So the dog movies I’ve enjoyed the most tended to temper the temptation to turn the dog into some genius parolee from the pound, and instead, portray them as what they generally are: faithful, furry companions who love us unconditionally, but who are largely incapable of resisting an open trash can, let alone driving a dump truck. Now, it is true that dogs can be very protective, even heroic, when it comes to caring for their human pack. And it is also true that some dogs, with proper training and patience, can learn to do some pretty impressive things. After all, the dogs in the movies do amazing things all the time, because a human being actually taught them to do whatever stunt the dog character they are portraying is supposed to be doing in the film. But the fact remains, they don’t just pick this stuff up on their own. So if you’re going to have a story about a highly skilled heroic dog and you want it to be believable, you better establish a credible reason for the dog to possess a skill set that allows him to interact with humans in a concerted effort to accomplish something more than bringing the Frisbee back to whomever threw it in the first place. A pretty good example then, I think, is the movie Max. The title character, Max, has spent months in a special USMC training program where they literally worked him like a dog, every day, until he was capable of being deployed into a combat zone, and where he is then responsible for the lives of two-legged soldiers who depend on him every day. This isn’t just plausible plot material; this happens all the time. Thousands of dogs are employed by our military and special forces, law enforcement, not to mention fire and rescue, U.S. Customs and border protection, and security companies. We also have guide and hearing dogs, therapy dogs, physical assistance dogs, seizure alert dogs, and dogs for helping diabetics. All of these canine companions have spent months, even years, in extensive training programs as well as on-the-job-training to do very specific, very important jobs that their human counterparts simply are not capable of performing on their own. So when Max is shown following some specific commands, and even instinctively taking action to protect his pack, there is not a moment’s hesitation on the part of the audience to continue to suspend disbelief. The story is plausible, exciting, and believable because the writers (Boaz Yakin and Sheldon Lettich) did their homework and gave us a story about a dog we could relate to. And this is mostly because the story isn’t really about a dog, it just stars a dog. The writers understood that not everybody has a dog, and not every family has sent a son or daughter off to war, so these are not necessary prerequisites for enjoying this film. The core issues are far more universal, and they deal with love and trust, duty and sacrifice, decency and honor. I appreciated the honest performances from Church and Graham, two aging actors who brought warmth and depth to their parental roles where others might’ve been tempted to phone it in. We don’t just see the typical angry kid whose parents don’t understand him; we are given a glimpse of each of their private struggles as well as their collective, conflicted feelings. Each has guilt, and shame, and grief, and inadequacies that they struggle with alone. But they also have unique strengths and perspectives and capacities that allow them, together, to figure out how to get through the trials of life. Max helps us examine what makes a hero, at home or on a battlefield. We come to realize that a uniform does not define a hero; doing the right thing, even in the face of tremendous adversity, is where heroes are born. And in small, nameless towns everywhere, populated by families that look a lot like yours, are heroes. Moms and dads who work hard and sacrifice for their children, who teach their kids to be honest and respectful, and who have meaningful dialogues with each other. Children who love their parents and honor them, even if they don’t always keep their rooms clean, and have a deep yearning to grown up to be someone their parents will be proud of. So even if you’ve never loved a dog or lost a soldier, there is still power in this film. Watch it with your kids and talk about the choices and consequences of the characters, and how their decisions affected everyone around them. The real world has plenty of bad guys who give no thought to how their actions affect others, but there’s always room for more heroes.